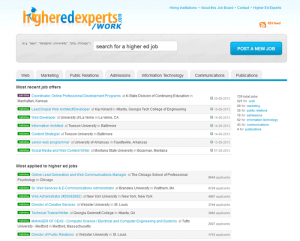 This job board, maintained by Higher Ed Experts for the higher ed community, was launched in July 2008 at higheredexperts.com/work. In August 2013 we moved to a new system to make it easier to use, maintain and reduce spam issues. You can post job openings from your university, college or school for free. included in Karine Joly’s weekly email newsletter sent every Wednesday to more than 2,500 professionals working in web, communication, social media and marketing for universities and colleges. How to post a job if you don’t have a free EMPLOYER account yet?